Our 30 bay Service Centre is located at our Artarmon location. High standards of workmanship ensure prompt, efficient and professional servicing and minimum downtime on all services and repairs. 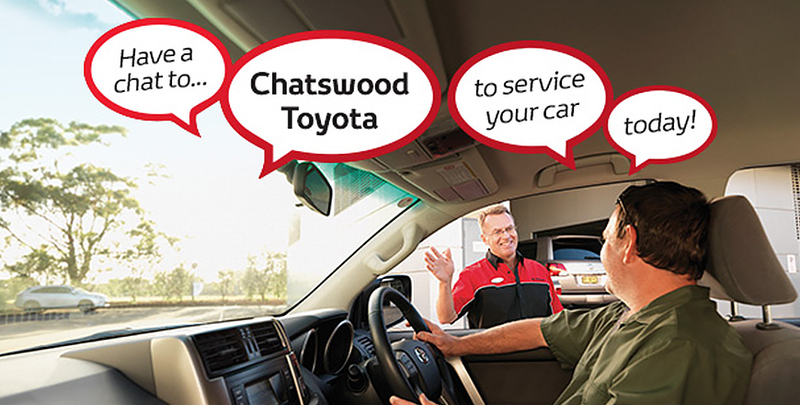 Chatswood’s large service team, proudly including 3 Toyota Master Technicians, use the latest in Special Service Tools, diagnostic equipment and servicing technology; with all technicians receiving ongoing training to keep your car in optimal condition. We offer a full range of workshop services for private, small business fleet and government customers. Our wash bays are fitted with full water recycling and a 15,000ltr rain tank to clean cars, allowing us to clean vehicles despite water restrictions. We take pride in being environmentally conscious. We recommend and will always use Genuine Toyota parts on your vehicle. Chatswood Toyota is Australia's Number 1 Toyota Dealer. We are a Toyota car dealer in Sydney and our new and used sales showroom is located on the Pacific Hwy at Chatswood. We have over 120 new Toyota vehicles, 80 used vehicles. We also have a dedicated fleet sales team and we have competitive finance and insurance options available. We are only 5 minutes from North Sydney and 10 Minutes from Sydney CBD. 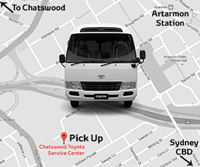 Chatswood Toyota Sydney is located at 728 Pacific Hwy which is at the Corner of the Pacific Hwy and Fullers Road Chatswood NSW 2067. Come and visit our Toyota car dealership for new or used Toyota vehicles and we offer great service and value. Leave the work to us, and enjoy the benefits and convienience of using our service centre. Departs from our Service Center, and arrives at Artarmon Station. Click here for more information about our Courtesy Bus Service. We also have the following:- Online Booking, SMS Reminder, Early Bird Service, Driveway Service, Waiting Facilities, Toyota Extra Care, Parts Department, Accessories Department.